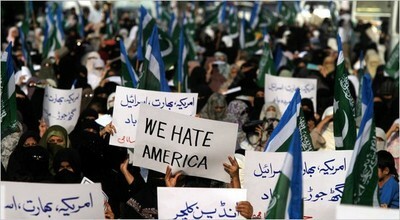 A typical anti-American demonstration in Pakistan. Americans may think that the failed Times Square bomb was planted by a man named Faisal Shahzad. But the view in the Supreme Court Bar Association here in Pakistan's capital is that the culprit was an American "think tank." No one seems to know its name, but everyone has an opinion about it. It is powerful and shadowy, and seems to control just about everything in the American government, including President Obama. "They have planted this character Faisal Shahzad to implement their script," said Hashmat Ali Habib, a lawyer and a member of the bar association. "You must know, you are from America," he said smiling. "My advice for the American nation is, get free of these think tanks."